Architectural Mouldings from Bob Lane Wood Turners can be used as the finishing touches in your home. These decorative mouldings are commonly associated with period properties, such as Victorian or Georgian homes and can be used in the restoration of these homes. Even modern properties can benefit from these attractive mouldings as they provide points of interest within a room. Here at Bob Lane Wood Turners, we manufacture a range of skirting boards, architrave and dado rails and these can be made to your requirements. You can bring in a drawing or a sample for us to copy, or we can work with you to design something new. 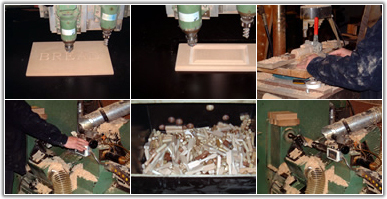 Our CNC machines are able to produce mouldings to a high degree of accuracy, so you can rely on us to get your order right first time. Architectural Mouldings are available from Bob Lane Wood Turners. We specialise in wood turning and as such we produce a wide range of products. We deal with private individuals and constructions companies, so we can fulfil large and small orders. If you would like more information about our products, please visit our website or give us a call on 01543 483148. Bob Lane Wood Turners is based in Lichfield, Staffordshire.